If you missed out these past few weeks with the TDB gauntlets, test your luck with an Exotic gauntlet Engram! 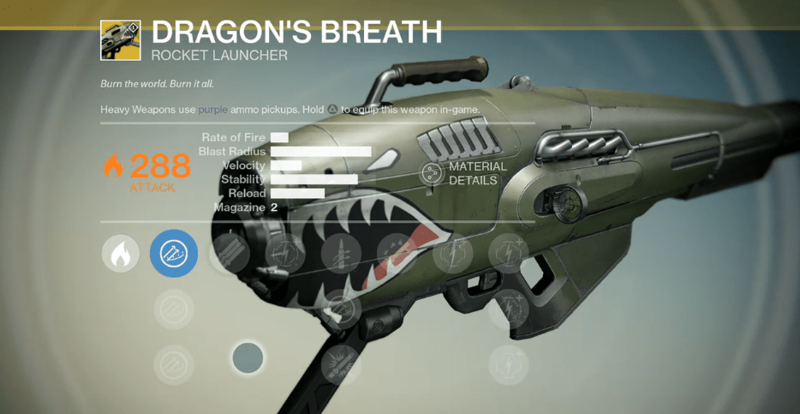 The blast radius on Dragon’s Breath is huge; tied with Truth with the highest blast radius among rocket launchers. Its rate of fire is also the highest out of the Exotic rocket launchers. It shares the ability to have 3 rockets in the magazine with Truth, although Dragon’s Breath requires the Tripod perk. Dragon’s Breath unique perk, Pyromancer, will leave a solar grenade effect in its wake for about 5 seconds. We have a fully upgraded review for this weapon! Dragon’s Breath really feels like a middle ground between Truth and Dragon’s Breath isn’t a bad weapon by any stretch of the imagination, and for some people in some situations, it may even preform better than the other Exotic launchers. The low velocity for this weapon is what really brings it down, with close to the lowest of all rocket launchers. Having a 3 round magazine size standard and replacing the first perk with proximity detonation might be something Bungie should test, as it would make the weapon a little more versatile while bringing it up to the same level as the other rocket launchers. Without the ability to track targets, this rocket launcher definitely isn’t for everyone, but it can be very useful in a few PvE situations. Dragon’s Breath is very fun to use, but when it comes time to kill some Wizards or anything but trash-mobs, Gjallarhorn is probably a better choice. It’s probably not worth buying unless you’re desperate for a new rocket launcher. Tripod – This launcher’s tube can hold three shells. Pyromancer – Rounds fired from this weapon leave a Solar Flare upon detonation. For the first time ever, the first pair of Exotic Titan boots (introduced with The Dark Below) are on sale! 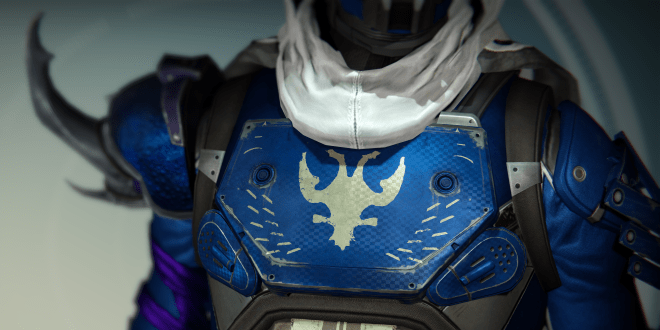 Peregrine Greaves are coming with the House of Wolves. These boots have a whopping 145/156 Strength. Be Somewhere Else – Increases the duration Shoulder Charge remains active. The Mk. 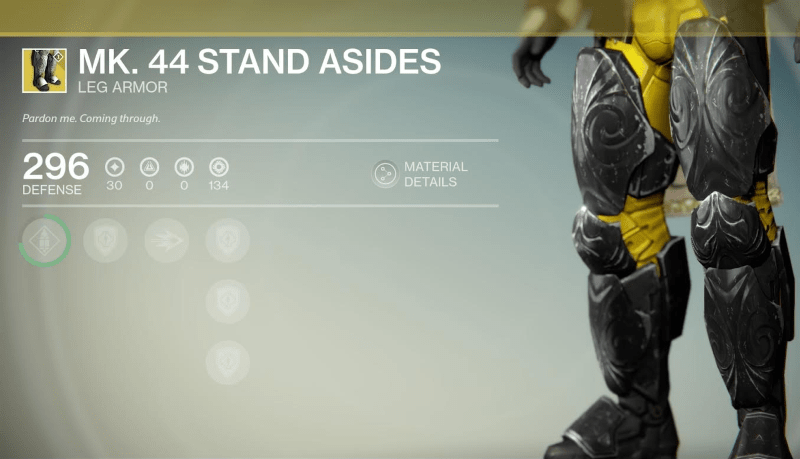 44 Stand Asides are a solid pair of boots for any PvP-focused Striker who enjoys getting up close and personal with the enemy. Often you’ll find that the window for shoulder charge is too short, having to plan your movement around getting that shoulder charge kill. These boots will extend the time it’s available by about 3 seconds, increasing it to 8 seconds from 5. These will enable you to run a bit longer, and the high Strength will ensure a followup Storm Fist for anyone who somehow lives through your Shoulder Charge. Use the Transfusion talent to further aid you on the field with health regeneration. If you’ve got spare Coins, and need a PvP-specific Exotic for your Striker, give these a shot. Keep in mind that if you’ve already got an armor piece that increases heavy weapon ammo, it’s not going to stack with these boots. Starfire Protocol was also introduced with The Dark Below expansion, and this is the first time it’s been sold. This chest piece has 144/155 Intellect – a very generous amount! Starfire Protocol’s main perk will give you an additional fusion grenade, but this does not stack with the Gift of the Sun talent in the Sunsinger talent tree. While this does pigeonhole you into taking Fusion grenades, it acts as the Gift of the Sun talent, allowing you to take Angel of Light or Touch of Flame. Touch of Flame allows your Fusion grenades to always ignite enemies, and in PvP this will help finish off anyone who you failed to stick the grenade to. Double this with Viking Funeral for extra damage! 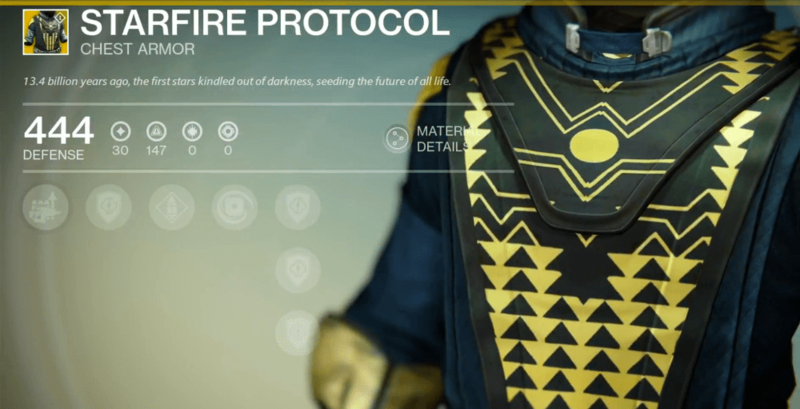 This chest piece will also increase your fusion rifle ammo and heavy ammo reserves, similar to the other Exotic Warlock chest for the Sunsinger, the Heart of the Praxic Fire. Maybe also test your luck with the Exotic gauntlet Engram, and you may get lucky with the Claws of Ahamkara. Xûr must have felt generous today, offering yet again a brand new item! 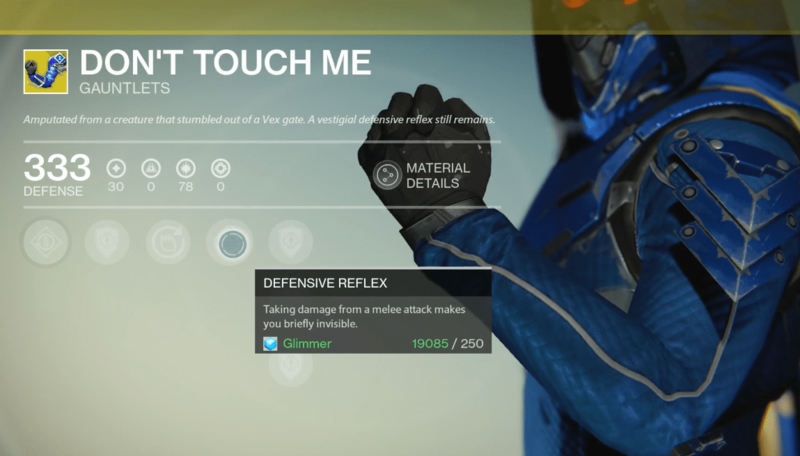 The Don’t Touch Me gauntlets were also introduced with The Dark Below. Ikaheka’s Hooks are coming with the House of Wolves. These gauntlets have 91/97 Discipline. While these technically aren’t a Bladedancer-only item, Bladedancer’s will benefit more from Defensive Reflex using their Shadowjack talent. Defensive Reflex – Taking damage from a melee attack makes you briefly invisible. These are definitely worth buying for PvE! The perks for these gauntlets are excellent, and you’re able to use them on both subclasses. The Defensive Reflex perk allows you to quickly escape any enemy in PvE if they get too close for comfort. Using the Shadowjack talent will increase your invisibility after getting struck to 6 seconds (3 more seconds than normal)! Don’t Touch Me will also increase your Super energy from kills in PvE, a great addition of course, but unfortunately not one you can use outside of PvE. The perks on these gauntlets are very well rounded, and will be extremely helpful in situations where you’re getting swarmed, especially in Crota’s End. While Defensive Reflex could be useful in PvP too, it’s unlikely that people will lose sight of you that easily for it to be effective. If you need some better PvE armor, pick these up.